Stenhousemuir rung the changes for this match at league leaders Livingston with Scott Fusco, Andy Stirling, Grant Anderson and Sean Dickson all coming into the starting eleven. The changes were partly enforced through injury and suspension but there was also a difference in tactics and formation. The Warriors started the game with a 3-5-2 set up but it was a fluid formation that altered throughout the first half as and when required. Occasionally it went to a back five and Livingston struggled to get their attacking game going for much of this period. The home side rarely tested Ally Brown but they made the breakthrough in the 34th minute of the game. The Warriors had a legitimate complaint about the initial freekick that was given as Kenny Deuchar seemed to foul Scott Gibb but the award was given the other way and then when it was taken there was a clear foul on a Stenhousemuir defender by Bobby Barr whose header across goal was met by Iain Russell who finished in style to put the home side ahead. Stenhousemuir reacted positively to this reverse and Grant Anderson was unlucky to see his turn and shot pushed over by Tony Bullock when it looked to be heading into the net. The resultant corner was not cleared properly and a snapshot from Anderson just squeaked past the post with Bullock stranded. Livi were not playing that well but once again showed the difference between top and bottom in the 40th minute when Barr converted with a clinical finish after Iain Thomson had slipped. The half time whistle blew with Livingston ahead by two goals despite the match being an even contest up to that stage. The Warriors made a change at half time with Alex Williams coming on for Jordan Smith to add to the firepower up front with Willie Lyle donning the captain’s armband. Before the Warriors defence had a chance to settle down Livingston almost made it 3-0 when a Kyle Jacobs header clipped the crossbar but this was the last real threat that the home team made in the game. In fact Stenhousemuir should have scored in the 50th minute when a through ball by Stirling picked out Scott Dalziel but the striker dragged his effort wide when he had just the keeper to beat. Livingston were reduced to ten men in the 60th minute when Jason Talbot was sent off for his second caution. The latter offence was a rash tackle on Grant Anderson as he ran down the wing and was stupid when he had already been booked. 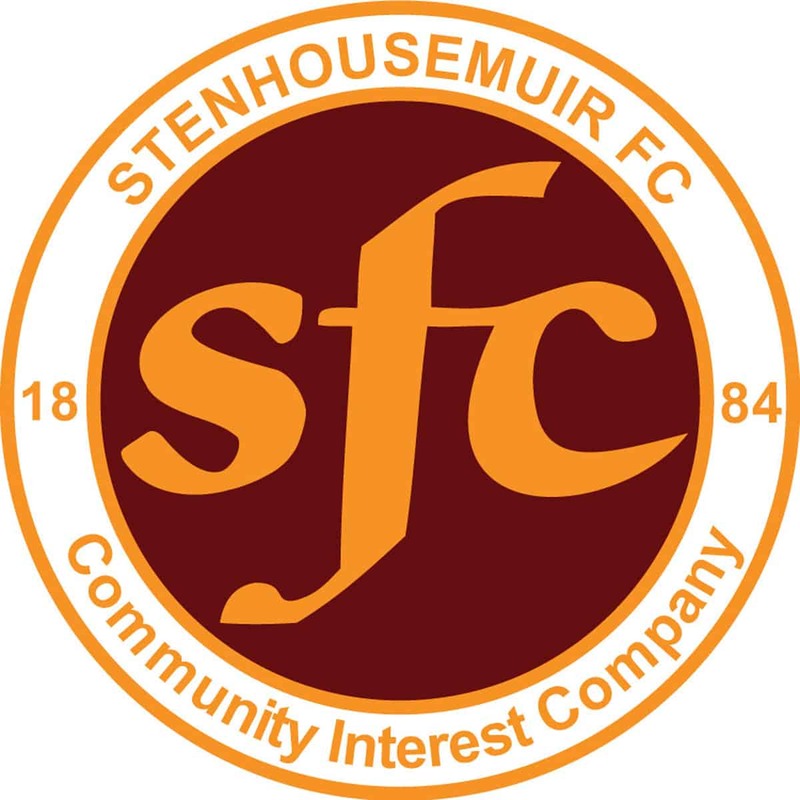 Stenhousemuir scored four minutes later when an Anderson cross was met by Alex Williams who slotted the ball home from close range. In recent weeks opposition teams have lost players through dismissals and went on to win the game without the dynamics of the play being altered. This time though the Warriors took a grip of the game and the league leaders were penned into their own half of the field for large periods of play. The Warriors continued to push for the equaliser with Livingston’s main tactic apart from packing the danger areas being to slow the game down as much as possible by fair means or foul. This led to six minutes of time added on after the allotted 90 by referee Alan Muir much to the ire of the home bench. With seconds of the game remaining Tony Bullock denied Andy Stirling with a good save that resulted in a corner kick. With everyone bar Willie Lyle pushed up for the corner there was a mass of bodies in the box when it was swung in. Eric Paton was about to shoot when he was fouled by Bobby Barr but the referee declined to give a penalty and blew for full time almost immediately and thus Livingston secured all three points. The game ended with members of both teams in strong debate with the referee but it was Stenhousemuir who had the stronger case for discontentment with the way the result had been forged by referee errors. This was a far better performance by Stenhousemuir and they deserved to get something out of the game but in the end it was another defeat that leaves them adrift at the bottom of the league. Livingston – Bulloch, C.Barr, Talbot [b40][so60], Hamill, D.Jacobs, Watson, Fox, K.Jacobs, Deuchar [Winters 61], Russell [Malone 66] and B.Barr. Stenhousemuir – Brown, Lyle, Dickson, Fusco, Smith [Williams h/t], I.Thomson, Stirling, Gibb [b28], Dalziel, Paton and Anderson.